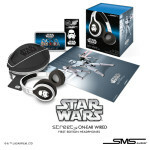 Hear the Force with these SMS Audio Star Wars headphones. They probably make the "Star Wars" theme song sound even better! The Force is strong with these headphones. Last year when 50 Cent’s SMS Audio released a line of Star Wars-themed headphones, it was something for the fans. 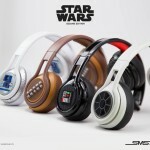 SMS Audio has since launched a second line of headphones just in time for the upcoming movie in December. The company has partnered with Disney for a couple of years now and is the official headphones provider for Disney Parks and D23. 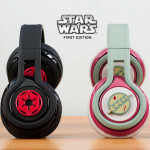 They have expanded their horizon with Star Wars and wanted to bring out the characters’ qualities in the headphones. No Jedi mind tricks here! 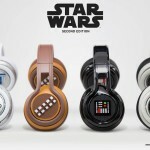 If you’re an avid fan of the Star Wars universe, you probably immediately recognized the movie imagery that inspired the designs of these folding, on-ear headphones. Choose from R2-D2, Chewbacca, Tie Fighter and Darth Vader or collect all four. These will be joining Rebel Alliance, Stormtrooper, Galactic Empire, and Boba Fett models from the first edition. These On-Ear Wired headphones are comfortable and sleek. Like the first edition, the second edition uses 40 mm drivers to help deliver the sound, making you feel the Force in each song you listen to. This allows it to provide noise cancellation and a clarity one would expect from higher-end studio headphones. The intricate Star Wars details on each of the headphones truly capture all of the characters, making these headphones the most coveted in the galaxy. Retail price is $179.95. You can purchase them on their website, other retailers, or at their booth at the D23 Expo this weekend where you can try them on yourself. The quality of the design and the presentation feel worthy of the price tag for any avid fan looking for a pair of good headphones inspired by Star Wars. “These are a truly unique set of headphones and they will last a lifetime,” says Danielle Jones, SMS Audio’s marketing manager. 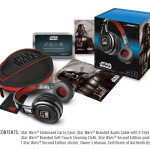 Want to win a pair of these Star Wars headphones? We’ll be giving away two pairs of these stellar headphones during the D23 Expo, so be sure to follow us on social media with hashtag #D23xDE and click HERE for more information on how you can win! Previous story Here are some of the special VIP guests that will be visiting the DisneyExaminer Newsroom at the D23 Expo. Next story UNIQLO meets Disney. Again.